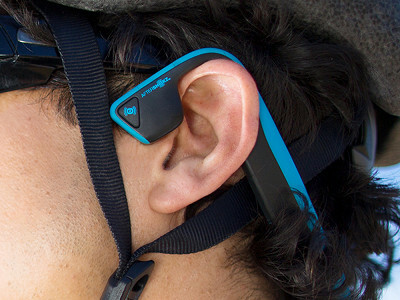 AfterShokz lets you hear music without having to cover your ears, so you’re free to hear ambient sounds around you. Joggers can hear cars, animals, and other potential hazards, while office workers won’t find themselves “tuned out” from important conversations. Because the Bluez 2 set is Bluetooth-enabled, there are no wires to worry about, either. 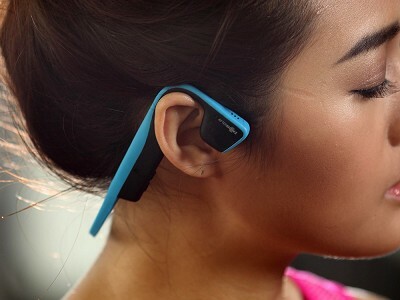 AfterShokz use “bone conduction technology." It was first developed by the military in the ‘80s, and SWAT teams continue to use it today. By sending audio signals through your cheekbones, the vibrations are carried to your audio canal. With normal headphones, sound goes straight to your ears, which can cause damage in the long run. AfterShokz bypass your ears entirely. The dual-microphone system even lets you talk, hands-free, on the phone. With a high-tech look (a la Google glass), these headphones are worn on the back of your head. They are comfortably made with sweat-resistant materials. And since nothing sticks in your ear, they don’t interfere with hearing devices, and you can share them with other people without feeling creeped out. This innovative audio is safe for your ears. . . and the rest of you. We introduced AfterShokz headphones because it's unsafe to run, bike, walk, or hike while listening to music with traditional earbuds or headphones. You can't hear traffic, barking dogs, or other warning noises. 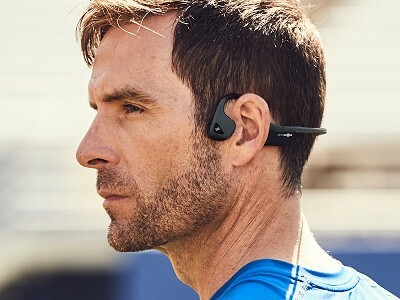 Using bone conduction technology to deliver sound with nothing in, on or covering your ears, AfterShokz are safer, more stable, and far more comfortable to use whenever you need to stay in touch with the outside world. Ask away. I am wondering if this technology could possibly enhance hearing for someone with hearing loss who uses hearing aids? @Vivian It depends on what type of hearing loss you have (conductive vs. nerve). I have both but mostly conductive and wear hearing aids. I own the sports version and they work. I'm not crazy about the way they fit and have been tempted to try the bluetooth version, which looks like it might sit a little better. @Vivian Hi Vivian - great question! Yes, we've had many customers with hearing loss tell us that AfterShokz are the only headphones they can use because of the fact they don't require the removal of hearing aids. @Tory - Great point, Tory. @Vivain Bone conduction isn't a solution in cases where the user has cochlea damage. Has anyone you know of tried these as musician's monitors, either in a studio or live concert setting? @Steve Hi Steve. Not as far as I know. But I'm double checking with the Customer Service team now in the case they know more. I'll get back to you! @Steve Doesn't appear that any of our customers have reported using AfterShokz in the way you describe. Sorry! I getting an Apple watch. I assume this should work with the iPhone and watch but is there any issue? Also, what is the sound quality for playing music? @William Hi William. The wireless Bluez 2 can pair to any Bluetooth-enabled device - Apple Watch included. That said, we're still in the midst of testing the headphone's functionality with Watch — no issues thus far! Premium sound is the deliverable our engineers have spent the most time perfecting. We're confident AfterShokz deliver the finest bone conducted audio available. 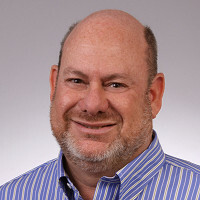 @Kim When you say AfterShokz delivers the finest bone conducted audio available, the only bone conducted devices I am familiar with are for voice communication, not music. How does the AfterShokz do with music compared to a comparably priced set of bluetooth headphones? @Kim As Michael point out, that's a meaningless statement when the available bone conductiondevices are not intended for music. Why not give direct statements describing the quality of music heard through your headphones? @Jim @Michael My apologies, gentlemen - I didn't intend to appear indirect with my reply. I meant to assure you that sound quality is supremely important to us - something we've spent much R+D focus on. They're designed to deliver high quality audio, with a range to satisfy both music and voice frequencies. AfterShokz have been compared to wireless bone conduction headphones manufactured by Panasonic and Damson Audio, both marketed for similar use, and we're confident our sound quality surpasses both. Hope that helps clarify! @Kim Kim, not to belabor the point but once again I will ask. How does the sound quality compare to a comparably priced pair of bluetooth headphones (not bone conduction)? Hi Michael and Jim, it's tough to compare the two because they're two very different technologies. Traditional headphones (or earpieces) give you sound directly into your ears and create the best sound quality possible by drowning out the world around you. Alternatively, Aftershokz, as Kim mentions above, delivers the best sound quality while allowing you to hear everything going on around you. That's the bone conduction technology in action. 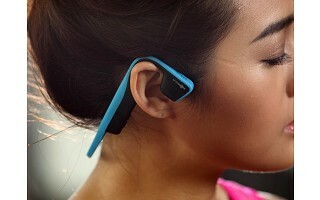 AfterShokz creates an ambient experience-- you hear music playing in the room, but it's not the only thing you can hear. It will be clearest (and most similar to standard headphone sound) when nothing else loud is happening around you, such as a quiet office, but the sound would be less prominent if a motorcycle passes you while walking on the street. It really depends on what kind of headphones you are looking for. Is it possible to wear AfterShokz if you wear glasses? Does it interfere with the earpieces on the glasses? @Debbie Hi Debbie - great question - we get it often! Yes, many of our customers wear AfterShokz with glasses and sunglasses all the time (especially runners and cyclists). We recommend putting your AfterShokz on first, and then slipping your glasses into place. 1. Can people nearby overhear your audio program? 2. Is there a microphone built in for taking phone calls? 3. Do you have any frequency response figures (specifically, bass range effectiveness)? @Steve 1. There is some natural sound leakage, especially if you have your volume maxed (though the same happens with ear buds on occasion). Our engineers developed a solution to minimize it in Bluez 2 — a technology we call LeakSlayer — and customer feedback has been positive. 2. Yes, Bluez 2 have dual noise canceling mics for making/taking calls. And Sportz M3 has a single noise canceling mic for the same purpose. 3. The frequency response is 20Hz ~ 20KHz. My husband runs 10 miles every day, even in our hot Las Vegas summers, and comes home completely drenched. Earbuds don't last very long for him. Can this product handle such intensity. @Debra Hi Debra. Yes, definitely! All AfterShokz headphones are both sweat and moisture resistant. They're built for high intensity activities and long-term wear. We've had many customers report that they're pleasantly surprised at their durability! I wear an iPod shuffle with corded earbuds that are waterproofed for swimming. Can your headphone be worn when swimming? @Candy Hi Candy. Unfortunately no - swimming is the one activity for which we can't recommend AfterShokz. We'd love to build that feature in to a future product though! How will AfterShokz work while riding a motorcycle with a helmet? Both for listening to music and making phone calls? @Ray Hi Ray - another great question! AfterShokz fit well with most bike and ski helmets, because they wrap around the back of your head, below the helmet. Full coverage motorcycle helmets may not have as friendly of a fit. I'd imagine that loud motor noise that commonly accompanies road bikes of that nature would impact your ability to hear music and voice calls as well as they'd typically perform. This activity is something we should test so we can accurately advise - so thanks for bringing it up! @Amir Hi Amir. I'm not sure I understand your question. Bone conducted sound doesn't rely on volume to work, but instead is based on your body’s natural ability to transfer sound through your bones. AfterShokz uses transducers (instead of traditional speakers) to convert sound into mini vibrations, sending them through your cheekbones directly to your inner ears. This bypasses any problems with the ear canal or middle ear. Hope that helps illustrate function. Please reply if I haven't addressed your question - thanks! @Amir We haven't heard of any negative effect related to implanted pacemakers. But to be safe, I'm going to check with our engineering team. I'll report back with official advisement from them ASAP. Which version would be best if I want to have them for walking/jogging, music and making or receiving calls? After reading the details of each it looks like the Bluez 2 would be better to answer my own question. Please feel free to add any comments that you may have. @Ronald Hi Ronald. Both models featured will allow you listen to music and make/take calls. Bluez 2 works wirelessly, so it delivers the value of untethered Bluetooth connectivity, while Sportz M3 would require a wired connection to your mobile device. Any plans on becoming wireless? @Misty Hi Misty. Bluez 2 is wireless! It allows you to connect to a mobile device via a Bluetooth connection to listen to music or other audio, as well as make/take phone calls. I mostly listen to audio books, how well do these work in that regard? Also do these put much pressure against the side of the head? @William Hi William. Many of our customers use AfterShokz to listen to audio books and podcasts - even GPS directions in some cases. In regard to pressure, it's minimal. In order to hear bone conducted sound, the transducers must remain in contact with bone — and AfterShokz are designed with the tension to keep them securely in place — but they're also built with enough flex to fit a variety of head sizes. One of the key reasons people choose AfterShokz is their comfort during extended wear. It's very rare for us to hear that customers have experienced any discomfort - and in the few cases it's been shared, it's been related to specific sensitivities. So, can someone with cochlear implants use this? I have two grandchildren with implants and I was wondering if this would work. Thanks. @Elizabeth Hi Elizabeth - great question. While we can't guarantee AfterShokz will work in all cases of hearing loss, we've had many customers with cochlear implants report back with positive experiences. Does the bluez 2 model work with voice commands comparable to some of the other late model bluetooth headsets on the market? @Ronald Hi again! The microphone on Bluez 2 will allow you to communicate with Siri on an iPhone, for example. 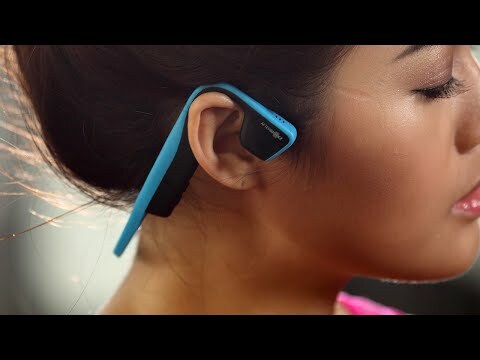 But it would not react to a voice command to the device specifically, such as "AfterShokz, pair to my iPhone". Does this work with Android phones? I have a Moto G first generation phone. @Victoria Hi Victoria. Bluez 2 will wirelessly pair to any Bluetooth-compatible device. Sportz M3 accommodate any standard 3.5mm plug for a wired connection. doesn't appear that they'd work well with either my eyeglasses or my over-the-ear hearing aids. Hi Joan, you are in luck! Aftershokz does fit with glasses. As Kim mentions above, you should just put on Aftershokz before your glasses. And for more good news, you don't need to remove hearing aids to use Aftershokz. Win-win! I have a narrow head for an adult -- when I purchase glasses or sunglasses I need to get petite or children's sizes. Will this adjust to fit a narrow head? Hi Renee, Aftershokz should fit you no problem. As Kim says above, they stretch quite a bit, but they also come with the headphones very close together giving them a wide range.